The Energy Transition raises big technological, economic, social and cultural challenges for society, politics and economy in North Rhine-Westphalia (NRW). One of the main technological tasks is the system integration of renewable energies, while at the same time ensuring a high level of security of supply and quality. Further challenges of the aspired Great Transformation of the energy system are related to compatibility, investment, profitability (including competitiveness and social compatibility), infrastructure and resources. Equally relevant aspects are the necessity for overcoming natural forces of inertia of established systems; achieving social acceptance for implementing processes of change; questions of social inclusion and participation; the political challenge of designing an integrative policy approach in a multi-level governance system; as well as the necessity to extend our understanding of (system) innovations. NRW as central energy and industry location needs to meet special requirements when implementing the energy transition. NRW is characterized by its industrial priorities; energy-intensive industrial sectors; covering whole value chains for a number of products; and by its spatial differentiation (region along the Rhine, Ruhr district, rural areas, etc.). Looking at socio-demographic aspects, NRW has the biggest agglomeration of population in Europe, a high population density and a very heterogeneous population. Lastly, there is a high density of university as well as non-university research institutes in NRW. The sustainable transformation of the energy system in NRW is supported scientifically by the Virtual Institute (VI) “Transformation- Energy Transition NRW”. In the context of the Virtual Institute, relevant topic clusters (1. Mentalities & Behavioural Patterns; 2. Governance & Participation; 3. Transformation of Industrial Infrastructures) have been developed. Furthermore, research institutions working on these topics have been connected. This process will be continued in the future, in order to enable the emergence of further networking and cooperation. The Wuppertal Institute for Climate, Energy and the Environment and the Institute for Advanced Studies in the Humanities (KWI) are leading and coordinating the Virtual Institute. 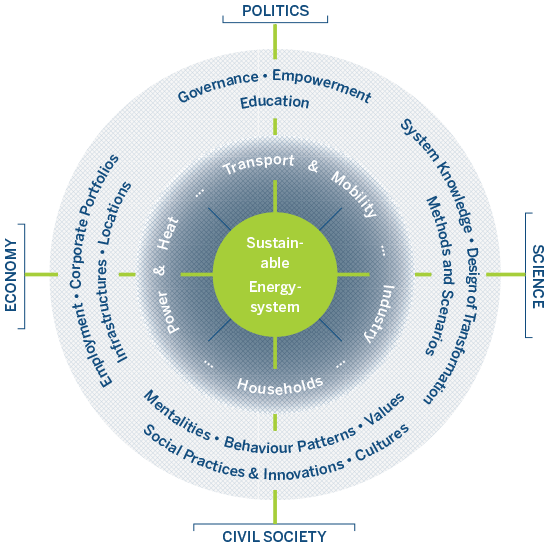 The research of the Virtual Institute focuses on socio-economic and cultural implications of the energy transition, taking the specific context in NRW into account. It is thus very much complementary to research on the national and European level. The focus here lies on connecting and coordinating the currently running projects “Mentalities and Patterns of Behaviour Concerning the Energy Transition in North Rhine-Westphalia” and “Verbundprojekt Energiewende.NRW – Bürger gestalten den Umbau des Energiesystems”, as well as the partners involved, and to ensure an exchange on focal points. In addition, further project applications will be developed. The focus with regard to content is to further develop the research agenda. The latter needs to be continuously adapted to new scientific findings. Furthermore, the project partners look closely at the topic of narratives of the energy transition, which will, hopefully, lead to innovations of concepts and content.